New police officer Christopher Dewey gets sworn in by Town Clerk Claudia Weber. Police Commissioner Jim Cole presides. 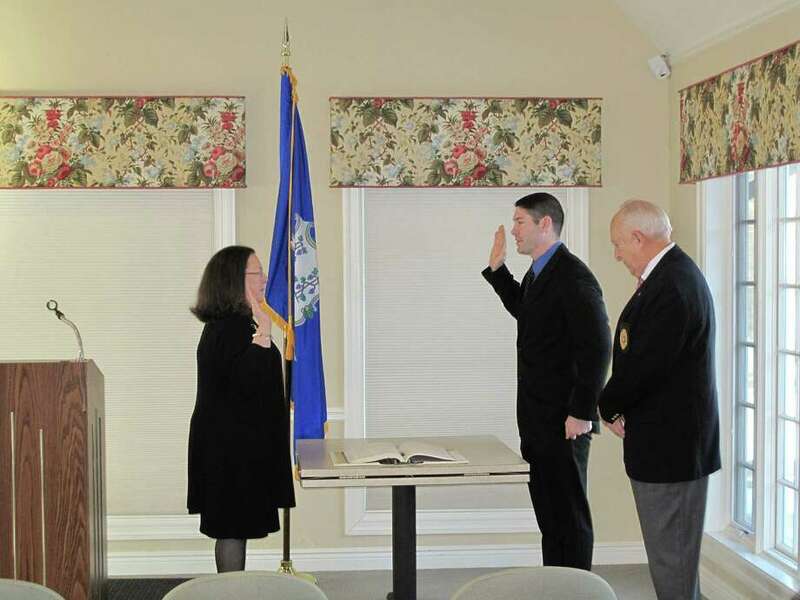 The ceremony took place Jan. 3, 2013 in the Lapham Community Center in New Canaan, Conn.
Christopher Dewey, 31, of New Fairfield has been sworn in as the newest member of the New Canaan Police Department. The ceremony took place on Thursday, Jan. 3, at the Lapham Community Center at Waveny Park. Present for the ceremony were many of the town's top officials, including First Selectman Rob Mallozzi, Selectman Beth Jones, Town Councilman Roger Williams, Police Commissioner Jim Cole, Chief Financial Officer Dawn Norton and Police Capts. David Bender and Leon Krolikowski. Police Chief Ed Nadriczny, speaking at a podium between American and Connecticut flags, said Dewey was the department's top choice out of 186 applicants. "Through our peer interviews, we knew we had a great candidate, we knew he was our number one guy ... We made Chris drive numerous times from the Albany area [for interviews], and he was always early, he was never late," Nadriczny said. Dewey was all smiles at the ceremony, repeating an oath of office issued by Town Clerk Claudia Weber, to officially become a member of the force. After the swearing-in, Dewey explained why he chose New Canaan. "After starting the process and seeing the town and the support network that they have here, I knew it would be a perfect fit for my family and myself," he said. Dewey was previously a commander of the Battalion Rear Detachment for the New York Army National Guard and holds the rank of captain with the Army National Guard. New England educated, he graduated from Norwich University, a private military college in Vermont, with a degree in physical education and has a master's degree in education from Springfield College in Massachusetts. Dewey began classes at the police academy on Friday, Jan. 4, and is expected to graduate in June. Following his graduation he will participate in a 12-week field training program before he goes on patrol himself. The process of interviewing, agility and fitness tests and a written examination started on Aug. 25. Dewey brings the police force up to 44 members, one shy of its full roster. His addition, along with the recovery of injured officers and others on leave, should help to alleviate some of the strain the police department faced over the summer, when some officers were forced to work extra shifts in order to maintain a mandatory minimum staff, as was mentioned at the Aug. 8 Police Commission meeting.